As someone with nearly three months of experience as a junior high librarian, I felt as though it was time for me to share my vast knowledge and wisdom in this new role. :) In all honesty and seriousness, I am still figuring it all out but wanted to reflect on my first few months and some things that I believe to be true as a bit of a State of the Library as I see it right now. Hopefully, I will look back on this in the spring and have evolved and changed to something even better. I have tackled my new role with a few core beliefs in mind and have taken action steps to support these ideas and make them a reality. 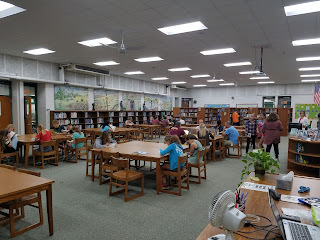 First, one of the most important things I wanted to tackle in this new role was to bring back the notion that the library is the place kids and teachers want to be and take ownership of. In order to make this happen, I have taken a few small steps that have shown positive impacts thus far and I hope to continue to develop. One action I have taken is bringing in student art and work to the library to showcase and share. This has created some ownership in the space as well as a great platform to share great student learning. I have started playing music in the library while kids are working or reading and even have kids requesting music now. Kids are in the library during their study halls, lunch periods (with food!) and even spill out during class time. No kid or teacher is turned away and it is not unusual to see three or four classes fighting for space within the library. Personally, I love seeing kids in one area looking for books, another set of students working in groups and a team of teachers collaborating all at the same time and in the same space. My goal is for the library to the heart of learning in the school and I feel as though we are on the right track. I have gotten rid of many of the traditional rules of a library. Learning is often loud and messy, and our library reflects that. Kids are talking, arguing, debating, discussing and engaging in collaborative learning throughout the library at all times of the day. The library was open the first day of school and will be through the final day. Even on days when I am out in a meeting, the library stays open and the learning continues. In addition, we allow food and drinks for kids who choose to come into the library to have a working lunch. We have also removed all restrictions on when kids can be in the library before and after school and are truly open whenever a kid needs us or the space. As most teachers do, I have professional goals that I have to set each year. This year one of my goals is to increase overall reading motivation and excitement for literacy in the building. I want to make reading cool again. A few small things I have done is create a request line for kids to share with me what they are reading to be used for purchasing books for the library. Rather than arbitrarily grabbing books off the shelf in the bookstore, I am tailoring the collection to what kids are reading and requesting. I am also dropping into classrooms daily just to talk about books I am reading and get them fired up about it. This is not just happening in English courses but also History and Science classes where I am working to get kids interested in literature tied to course work with high levels of interest. I am not a believer in incentive programs or sticker charts to get kids fired up about reading but am taking the approach of showing them that I am a reader and love it and try to share it with them as often as humanly possible. I am also utilizing our video production lab to create book talks with myself, students and other teachers to show off great books. Not only does it serve the purpose of sharing great reads but also for students to see their classmates and teachers sharing their love of reading. One of my coworkers has been calling me a squirrel lately. She calls me this because she claims I am easily distracted and often have 100 things going on at once. I will be in the middle of processing new materials and then a kid will come in and want to do a project in the video lab. As I finish that a teacher will come in and want some tech help in their room and on the way I will be stopped by a kid wanting a book recommendation. Boredom is not in my work vocabulary and I feel as though my lifelong struggles with ADD are finally paying off as my mind is in a constant state of flow and rapid activity. While this may seem to have little to do with the library, it actually does. I have been able to help more teachers and teach more students in my new role than I ever did as a classroom teacher. As a “squirrel”, I am able to jump around and be a part of so many projects and great work on a daily basis. The impact these small changes have had on our library has already been evidenced to me. Numerous parents at conferences last week shared with me how their child is talking about the library and how much they enjoy being in that space for the first time since elementary school. Teachers are constantly reaching out and holding their classes in the library or seeking out ways to engage with learning in the space. They are seeing me and the library itself as a resource to help them achieve their teaching and learning goals. However, the best feedback has been from the students themselves. When an 8th grader who has hated reading and never wanted to be in the library, comes up and thanks me for helping them see that reading was cool and the library is “sick”, I chalk that up to a win. I am only a few months in and my journey is just beginning but I finally feel like I am settling in and can really push the envelope. I look forward to continuing to evolve and grow in a way that serves the community of learners in our school.